On the land behind the present Clock End stood St. Johns College of Divinity. Norris managed to take out a 21 year lease on the recreation fields of the college for twenty thousand pounds. The preparation of the ground in order that the pitch could be laid had cost over £125,000. The new stadium was designed by renowned stadium architect Archibald Leitch, it featured a single stand on the eastern side, and the other three sides given banked terracing. Arsenal played their first competitive game at Highbury against Leicester Fosse on 6th September 1913, winning 2-1. The stand took three years to complete, and was the only covered spectator area. Norris had to pay the builders a bit at a time from the gate money. No significant portion of Leitch's original stadium remains today, following a series of redevelopments during the 1930s. The first of these was the West Stand, designed by Claude Waterlow Ferrier and William Binnie, with a distinctive Art Deco style, which opened in December 1932. At the same time, the local Tube station was renamed from Gillespie Road to Arsenal. The terraces at the north and south ends were both given roofs. The roof of the North Bank was built in 1935, resulting in the clock being moved to the South End, giving it the name Clock End. Leitch's main stand was demolished to make way for a new East Stand matching the west one in 1936, with its distinctive facade facing onto Avenell Road. The stadium stayed more or less the same for the next fifty years, although during World War II the North Bank terrace was bombed and had to be rebuilt. Floodlights were added in 1951. The North Bank was demolished in 1992, and a new all-seater stand constructed in its place. 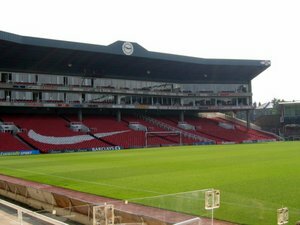 The Clock End was retained but redeveloped, and had seating and executive boxes fitted. Now the stadium has a capacity of 38,500. 12,500 in the North Bank, 11,000 in the West Stand, 9,000 in the East Stand and 6,000 in the Clock End and is all seated, and has two Jumbotron screens in the South-East and North-West corners. The stadium's main entrances are on Gillespie Road, Avenell Road and Highbury Hill. Before the all-seater era, on 9th March 1935, 73,295 fans attended a 0-0 draw with Sunderland. This stands as the Arsenal record attendance at Highbury to this day. 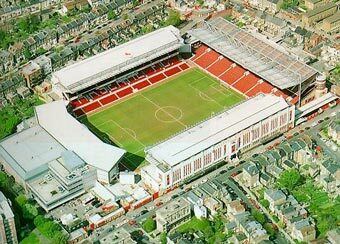 The 2005-06 season will be Arsenal's last at Highbury. The club will relocate in the summer of 2006 to the new Emirates Stadium nearby. From the M1 exit at the A1 turn off - Junction 2/3. The A1 merges for a stretch with the A406. Keep to the A1, soon called Archway Road and then Holloway Road. Turn left onto the A503 Seven Sisters Road and after 1 mile right onto the A1201 Blackstock Road which becomes Highbury Park. Turn right into Aubert Park and right again into Avenell Road.